While trolling the Orlando/Orange County Comptroller site tonight, I came across what seems to be an interesting notice of commencement, seen below for "Site Work". 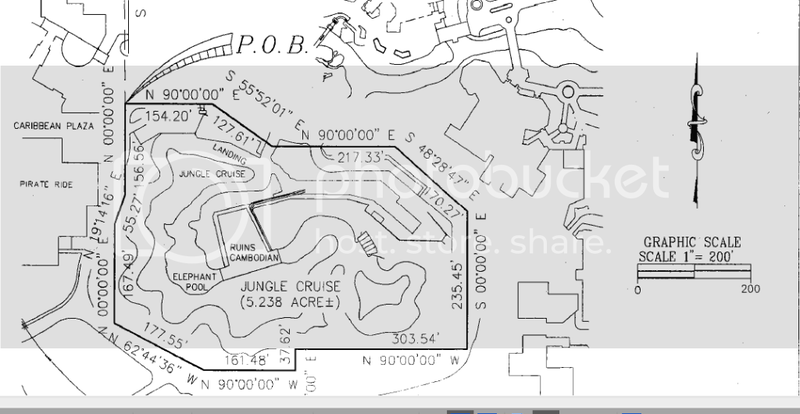 And with it, came this diagram, which includes the entire area of the Jungle Cruise, including Shrunken Ned's Junior Jungle Boats, and the backstage boat maintenance area. Now, I'm far from an expert on these, but I would consider myself somewhat of a Jungle Cruise expert being a former skipper myself. Michael believes this may just be related to Fastpass+, and he may be right. But the whole area, including backstage areas, being included on it leads me to believe it may be a bit more substantial. Could it be the long delayed JC refrub? I sure hope so. Anyone who may know more, feel free to leave a comment or talk to us @Parkscope on twitter. I'm in the current fold of skippers and everything we are being told at the moment are just rumours but they are consistent. Refurb will begin next year and take approx 8 months to complete. Being added for definite is a wheelchair dock, separate from the regular dock. Think kilamanjaro safari, toy story mania type of thing. But everything else is just speculation. Such as 5 extra minutes being added to the ride making use of the maintenance bay and treehouse waterways to do so. Other rumours include a brand new storyline for the jungle and with that a new spiel which we are lead to believe may be semi-automated. The only thing we know for sure at the dock is that we are getting a wheelchair dock and we will go down next year for 3/4 of a year. On a side note, pirates refurb has now been pushed back to 2014 because of this. I'm a pirate too and tbh, pirates needs it more. The expiration date on this notice is 10/26/2012 so that is a littler over two months, not really time for anything major, unless it's something that will be prep for a bigger update at a later date.